I don’t know if you noticed, but I briefly mentioned the name of Chad VanGaalen during my last review of Timber Timbre’s Hot Dreams. But ok, I have to accept that my footnote was easy to be missed and, of course, doesn’t reflect the man’s stature of being a wonderful multi-instrumentalist, illustrator and animator. However, we’re in luck because a few days ago VanGaalen released his newest scion, Shrink Dust. So that’s reason enough for me to give him the sort of attention he deserves. 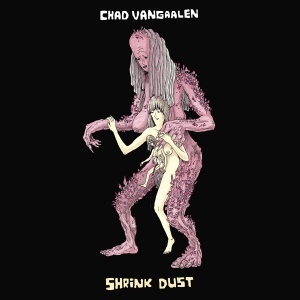 Describing Chad VanGaalen’s artistic repertoire is nearly an impossible task, for listening and looking to hiswork is in fact a journey into blurry other dimensions. VanGaalen’s fragile way of singing, or better said fictional storytelling, is sometimes a deceitful experience. Spooky on the one hand, whilst soothing on the other. Also, the use of homemade instruments that are recorded on tape add up to strumming lo-fi style that typify VanGaalen best. Along with his musical talents VanGaalen was always keento weigh in his drawing skills as well. Album covers and videoclips are single handedly given colour by his own hand drawn freak art. In my opinion, Soft Airplane (2008) and Diaper Island (2011) are probably his best albums to date. Both excel in melody, sincerity and otherworldly estrangement. And by the looks of it, Shrink Dust will be a logical continuation of the aforementioned. Let’s cut to the chase,Shrink Dust breaths out surreal daydreaming in which song structures make things morphs into other things that eventually will starts morphing into something else again. Still following? If not, VanGaalen’s opening sentenceson ‘Cut Off My Hands’ serve a perfect examples for this process: “Cut off both my hands and threw them in the sand. I watched them swim away from me like a pair of bloody crabs. Close my eyes and dream of different skies. Stare straight at the sun and try not to cry for you”. The twelve track counting Shrink Dust is all about this sort of gloomy bizarreness and is frequently accompanied by the sound of a pedal steel guitar. Shrink Dust is therefore at first and foremost a country record, at least according to VanGaalen. ‘Weighed Sins’, ‘Weird Love’ and ‘Cosmic Destroyer’ will surely make you think of wide and empty landscapes, however lyrically, benign evil, talking plants and mythical creatures make this ‘country record’ at least a bit odd. On ‘Monster’ VanGaalen elaborates about waking up to find himself turned into a hideous monster: “Ripping my eyelids a little bit wider are two prying hands that grew out from my shoulders, and I can’t explain why, but it’s hurting my eyes”. The catchy chorus probably make ‘Monster’ one of the most lively tracks. Same goes for ‘Leaning On Bells’ though, which remind of the riffy tracks from Diaper Island. In comparison to Diaper Island Chad VanGaalen’s latest is has a darker kind of narrative and is musically more spacious. Maybe I enjoyed Diaper Island more because it more for its energetic and open hearted variety. But that doesn’t mean I can’t appreciate Shrink Dust thematics of fear and evil that are heard throughout the whole album. So don’t expect any cheerfulness. Yet, on a different level Shrink Dust does has a lighter side to it. After several plays it becomes clear he’s actually is having fun when he’s experimenting with his newly acquired pedal steel guitar. Be that as it may, on Shrink DustChad VanGaalen ultimately addresses themes of mental transformation and by doing so he continues to map the unknown corners of his own universe. Only in the end, the journey through just became more arduous. This entry was posted in WRM and tagged animator, Chad VanGaalen, country record, Diaper Island, Hot Dreams, illustrator, instrumentalist, lo-fi, monster, Shrink Dust, Soft Airplane, Sub Pop Records, Timber Timbre. Bookmark the permalink.